Come September, we scout daily for signs for oxblood lilies. Not only did August rains prompt generous red bouquets this year, I pulled up one day after work to an October bonus! The bees were as thrilled as I am for another flush of flowers on my Mexican Bird of Paradise (Caesalpinia mexicana). 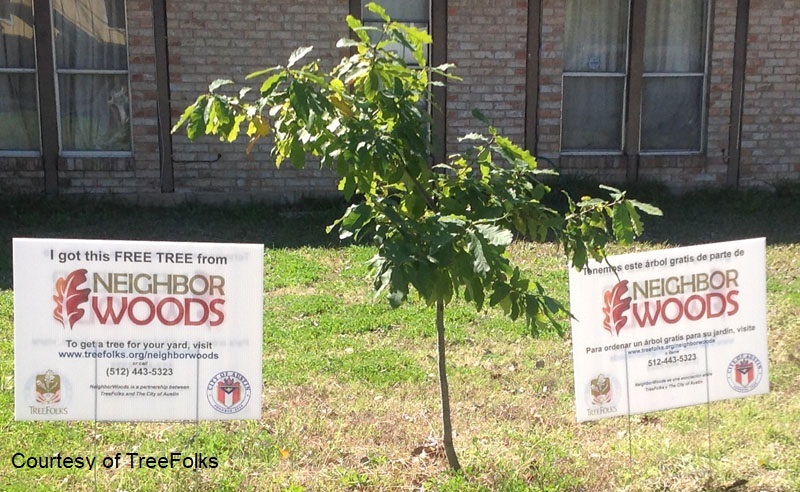 I wouldn’t plant this one as we head into winter, but fall is really the best time to plant native trees. 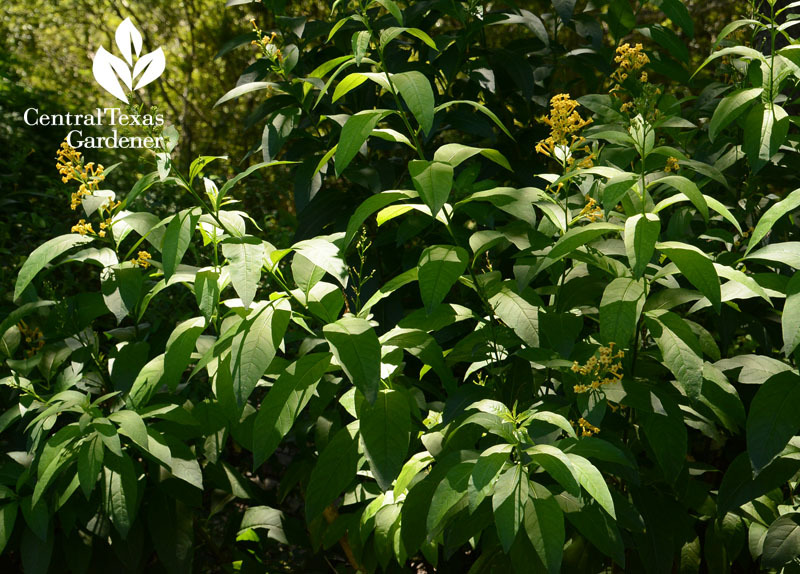 Consider adding flowering and fruiting understory small trees/shrubs like evergreen sumac and possumhaw holly to your shade tree list. But sigh, after years of tending prized shade trees and understory companions, we discover that we made some mistakes. Limbs are crowding our roofs or falling on power lines. In recent rains, many trees tilted or actually uprooted entirely. 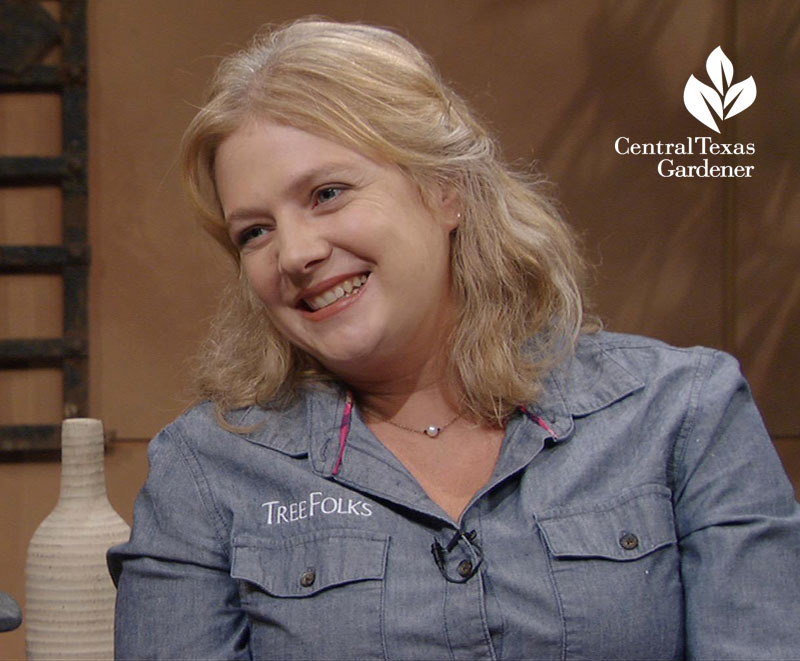 Thais Perkins, Executive Director of TreeFolks, is here to spare that angst! Get her tips to start out right and how to deal with those tilting trees. Watch now! 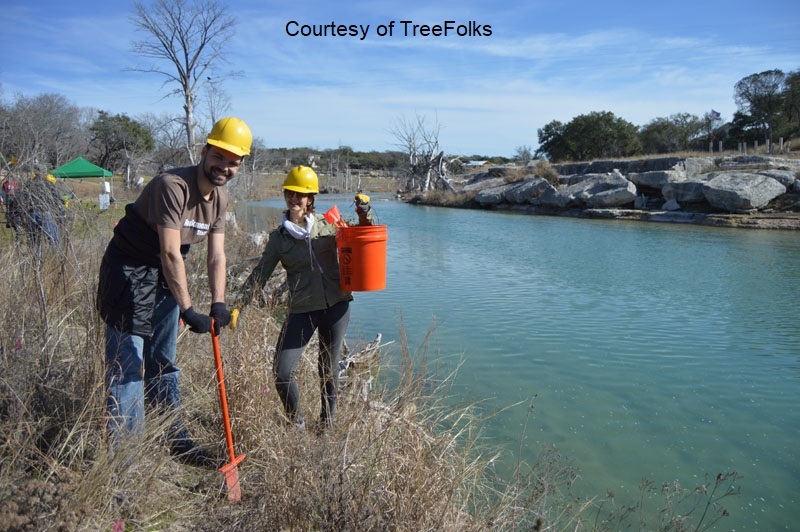 Check out TreeFolks’s website for resources, their timely blog, how they’re reforesting the Blanco River and Bastrop, and if you’re in Austin, how to get free trees. And, of course, to volunteer! 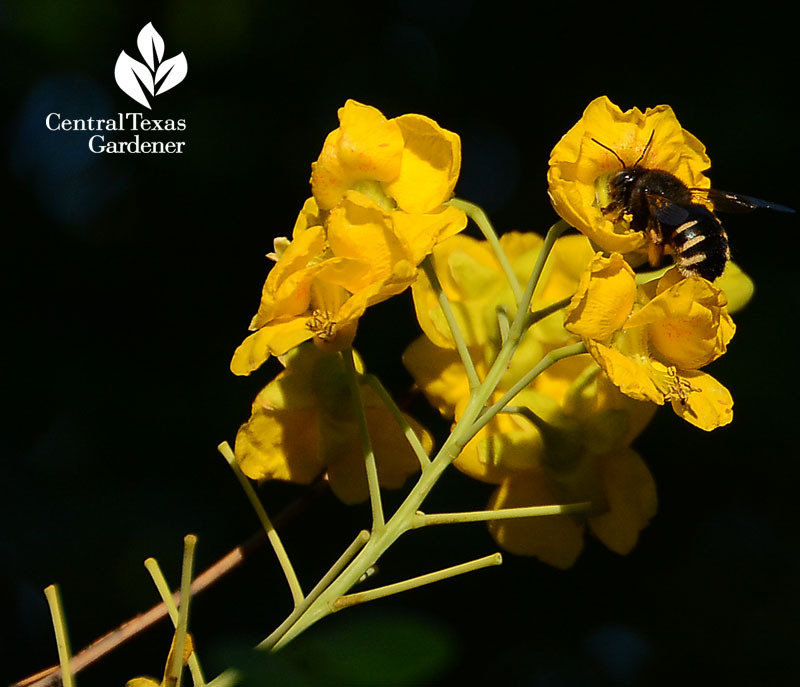 This fall, what about adding a native honey mesquite? 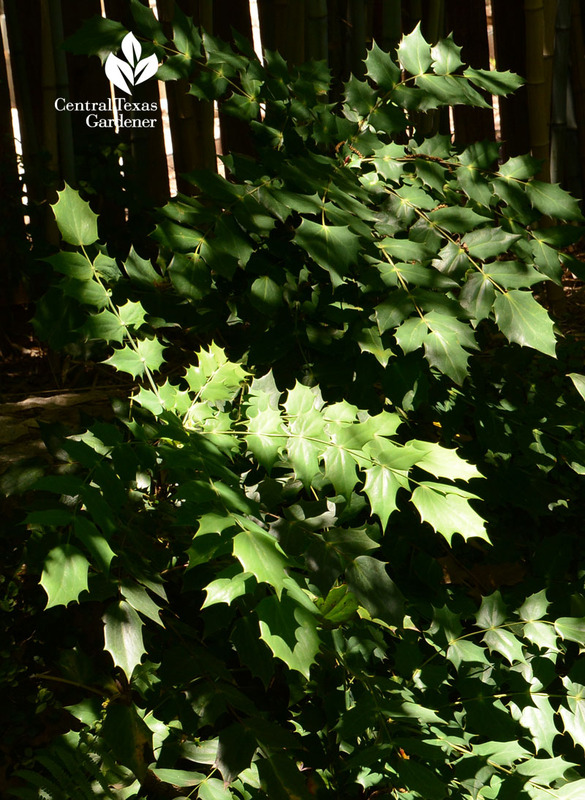 Daphne explains how to plant this pollinator and bird-loving tree for graceful dappled shade. Find out more. Got shade? 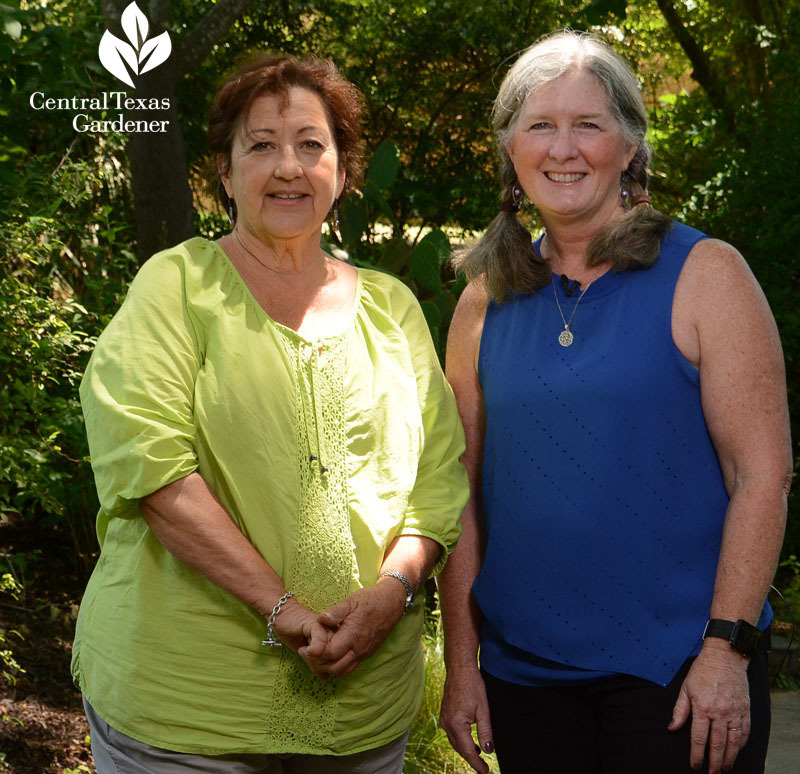 Barbara Wise from Crescent Garden joins Trisha at Lake Austin Spa for really bright ideas, in deer country, no less! 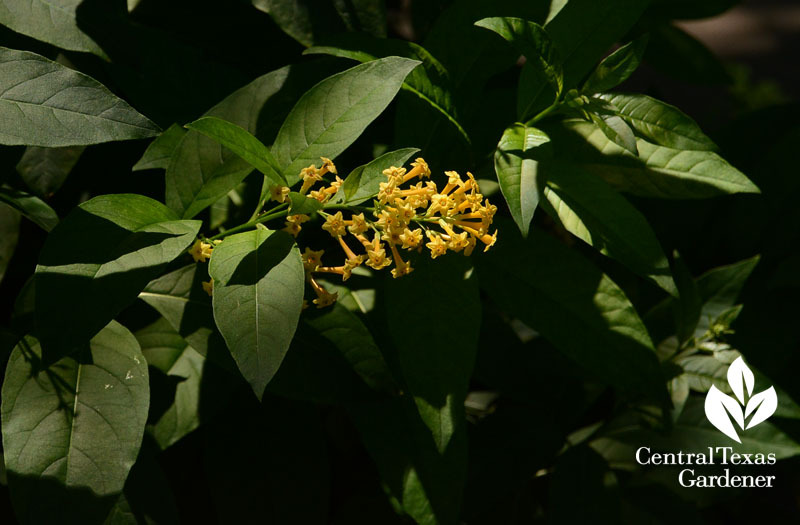 Shrubby cestrum, this one ‘Orange Zest’, adds leafy flair to light-catching flowers late spring through fall. Hummingbirds will flit on over for a taste! 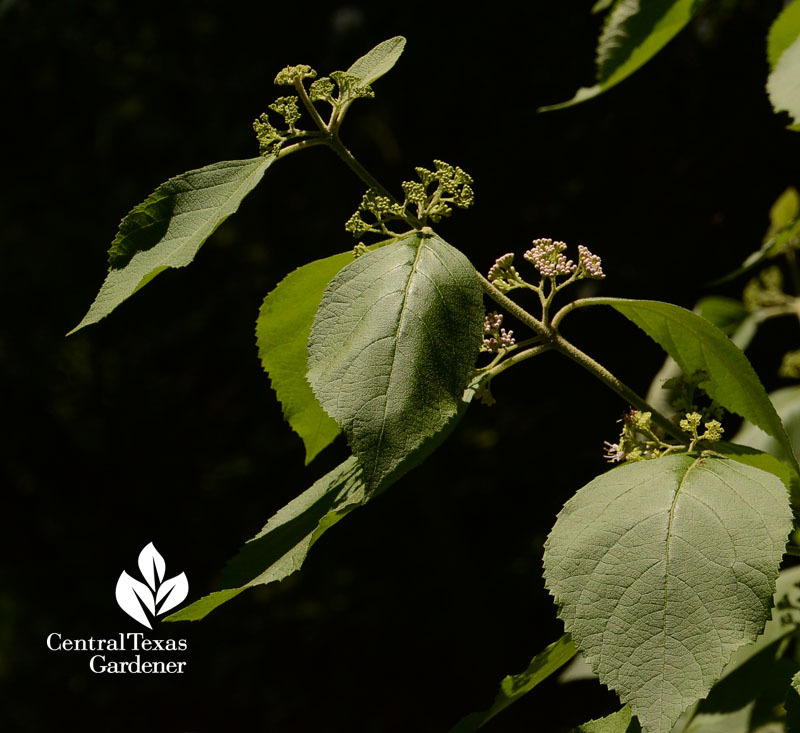 Native American beautyberry is a must-have for understory spring flowers and fall berries for birds. 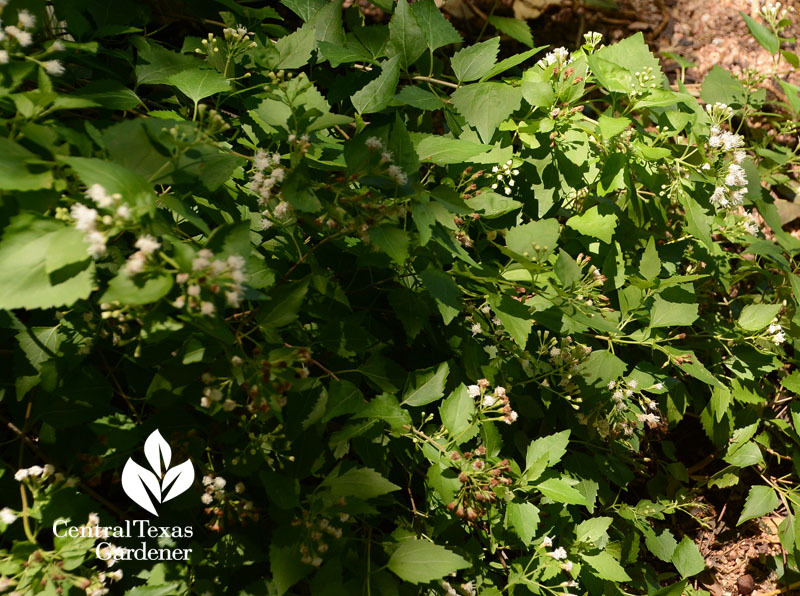 Native white mistflower (Ageratina havanensis) is one of my favorite native perennials. 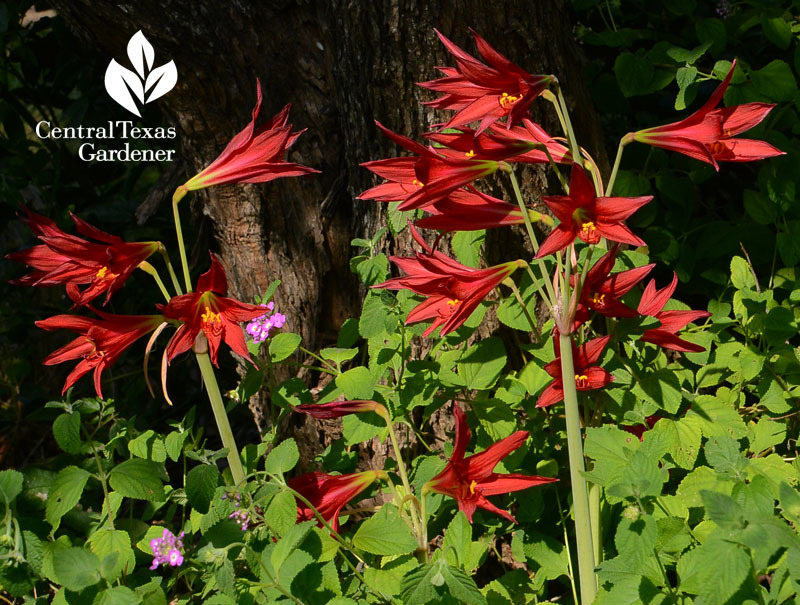 It can bloom in spring but really sparkles in fall to attract flocks of native pollinators and migrating butterflies. I include this picture of evergreen Mahonia aquifolium to illustrate how well it handles shade with burning blasts of sun. Mine are incredibly drought tolerant and trouble-free. 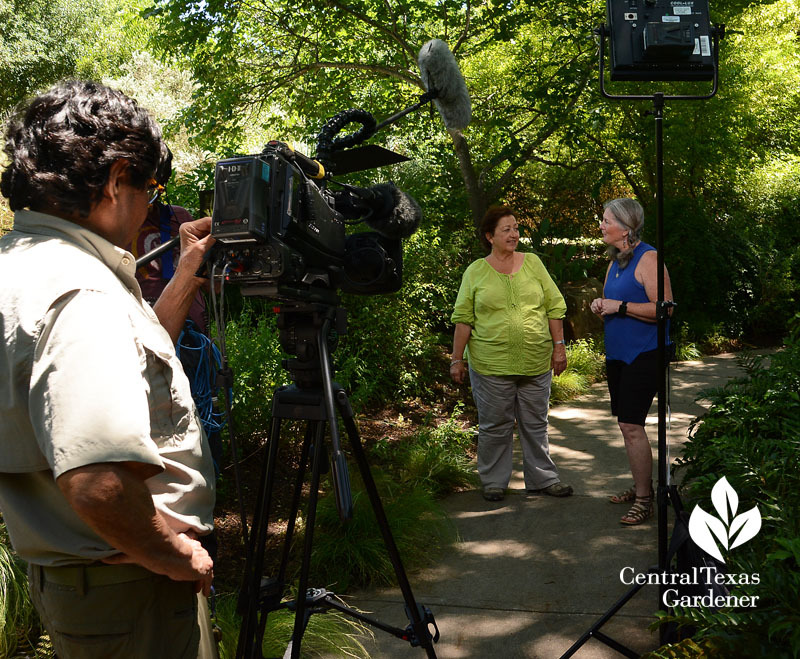 Even though Trisha’s got lots of flowers going on (some not in bloom when we taped), one secret to an interesting shade garden is mixing in diverse textures and leaf forms. 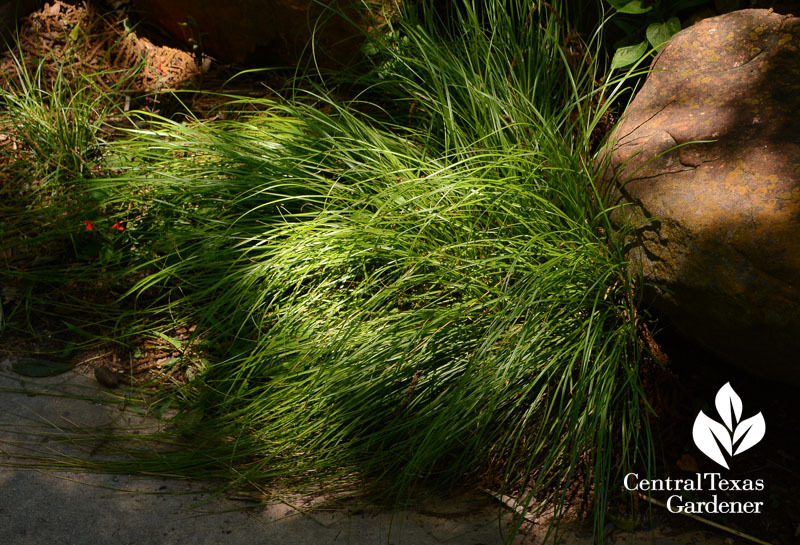 For groundcover, you really can’t beat evergreen sedges. That wispy foliage beautifully counterpoints broad-leaved plants and needs such little care. Japanese variegated sedge diversifies the all-green palette. Sparkler sedge is another favorite, though it can be hard to find. 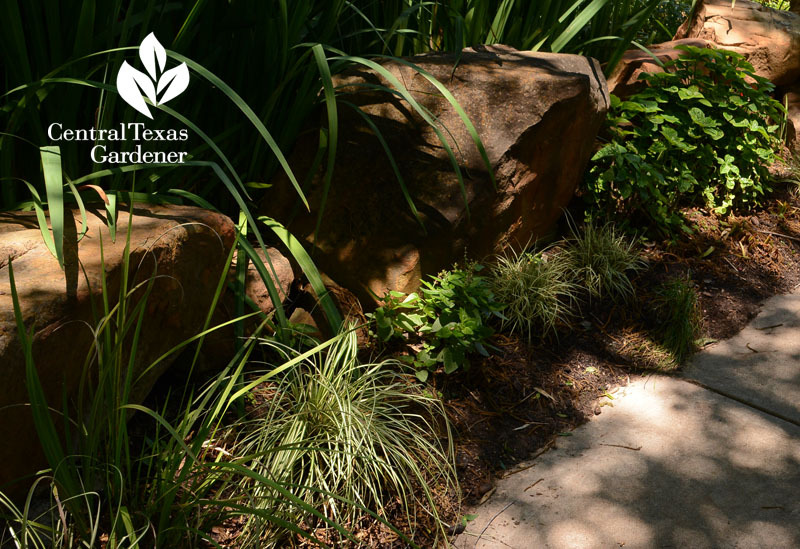 Commonly available and tough-as-nails Aztec grass (Liriope muscari ‘Aztec Grass’) is a very reliable, drought-tough evergreen. Native wavy scaly cloakfern puts a spin on made-in-the-shade texture. Trisha layers seasonal bulbs under dormant perennials, including herbaceous salvias. Even in shade, she’s got something to attract wildlife all year. 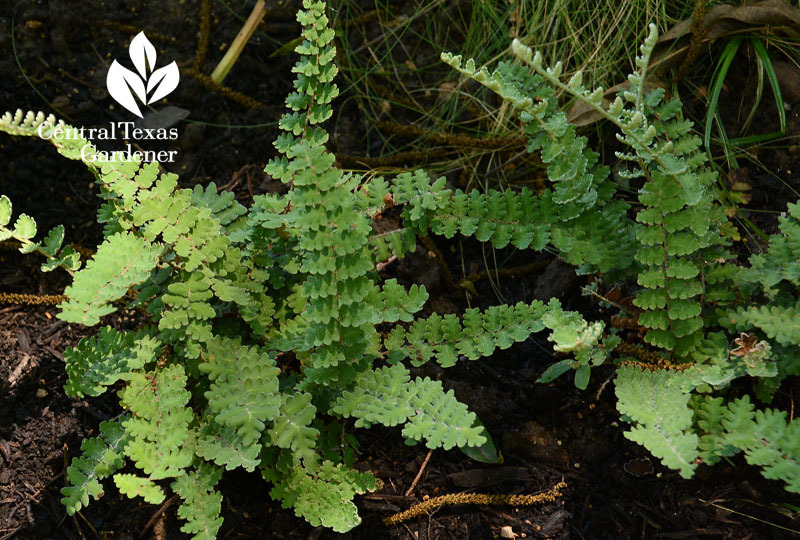 Get their shade plant list and watch now for more ideas! 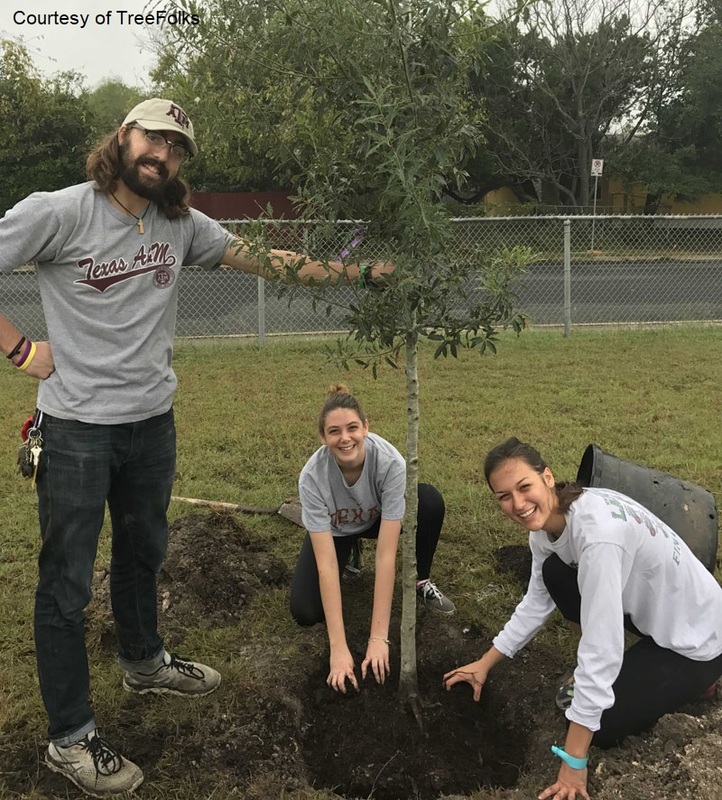 On tour, Valerie and Master Gardener Kirk Walden renewed dimension, shade and wildlife habitat while including playgrounds for their active, rescued dogs. 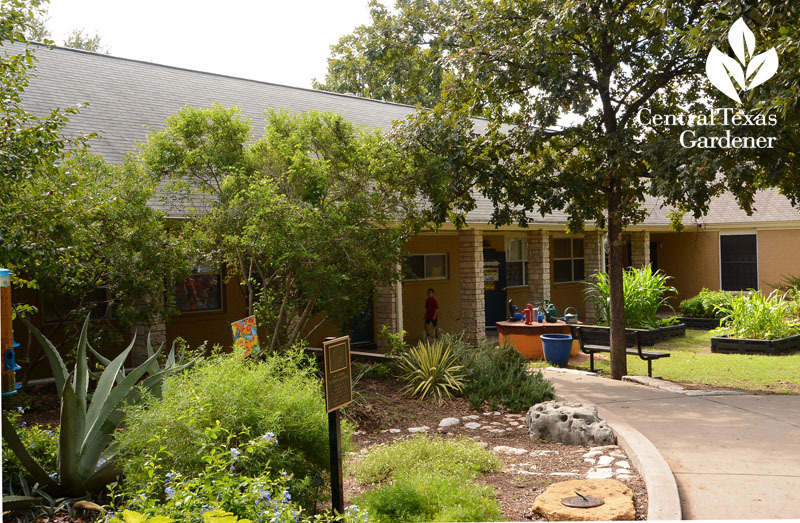 When they bought their razed property overlooking Lake Austin, it looked like this. Before Kirk dug in, he consulted Annie Gillespie and Rachael Beavers from Botanical Concerns for architectural structure and berms for captivating views from many perspectives. Note that the smaller limestone pool is patterned after the one at the Lady Bird Johnson Wildflower Center. 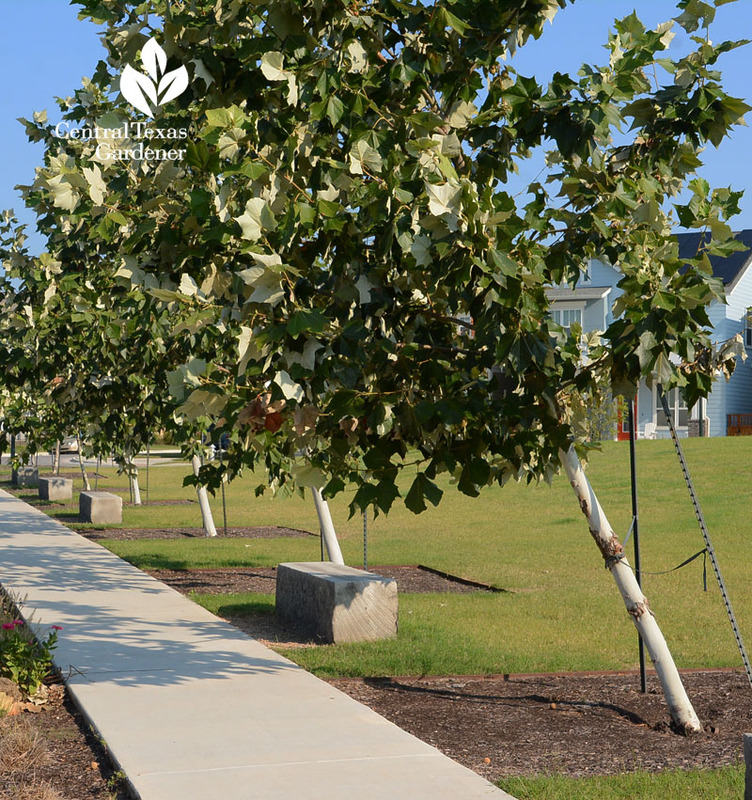 Terraced beds and berms partner texture, color, and wildlife habitat without obstructing the lake view. Botanical Concerns chose deer fencing that practically disappears against the seasonally changing perennials to attract wildlife all year. Along the house, raised beds allowed them to go without railings that would have obstructed the view. 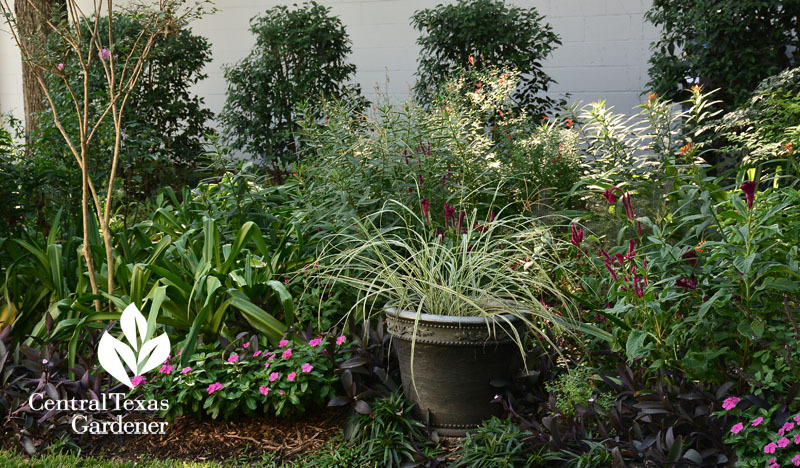 From one end to the next, it gravitates from sun to shade, so they matched textures, color and forms along the way with different light-needs plants. They installed low-water use Palisades zoysia since energetic dogs Cooper and Belle Haven need lots of family run time. We nabbed a superb high-in-air catch on tape! 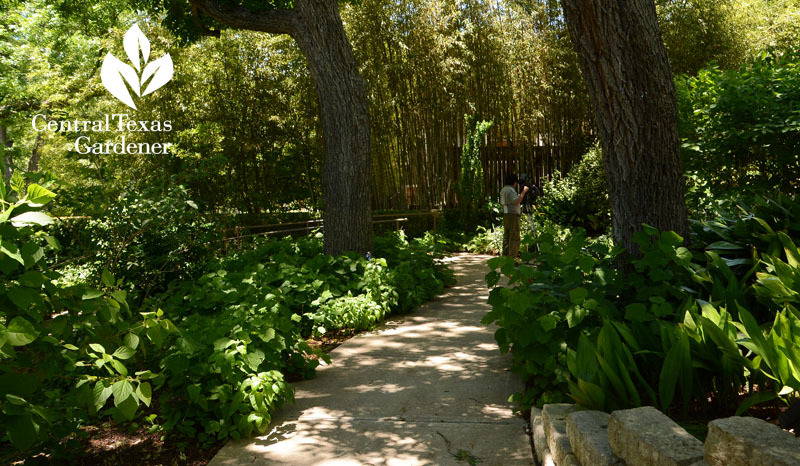 Valerie, an artist, helped paint the garden’s vision. Now, their renewed wildlife habitat inspires her art. Her artistic eye saw potential in a beam that didn’t work out. Rather than haul it off, she installed it as a tribute to the 360 bridge. Overall, their first challenge was redirecting the hillside’s flooding waters via the berms and dry creek beds. Starting in front, Botanical Concerns diversified and channeled runoff to the back for slow dispersal. Curbside, a terrace prevents erosion and trickles water down through its layers. Caesalpinia gilliesii, pink skullcap, and silver ponyfoot. And here’s Kirk Walden’s plant list! Well, there’s so much more! Let’s just watch it all right now.